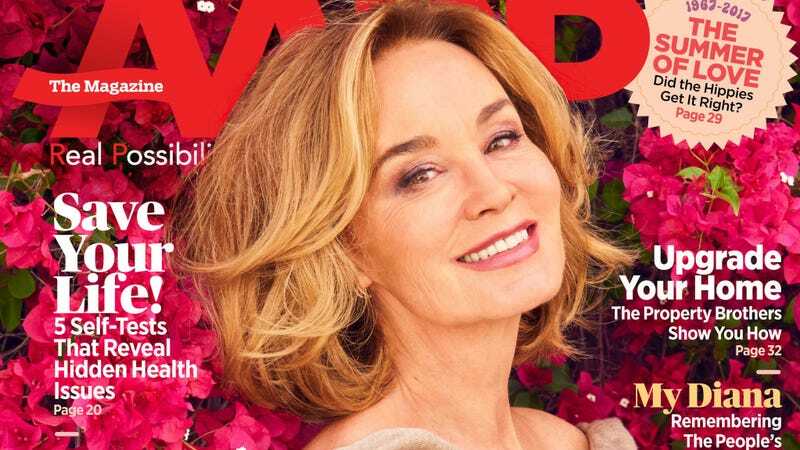 Sixty-eight-year-old Jessica Lange fulfilled one of the goals on my personal bucket list by appearing on the cover of AARP Magazine this month. Inside, she’s interviewed in the piece “Jessica Lange Can Finally Relax” (a perfect headline), where she discusses her fascinating career, her most legendary romances, and what she calls the “pervasive” problem of ageism in Hollywood. I knew when I did [the character of] Frances that it was something extraordinary. I love those kinds of parts, with huge emotional swings. But Tootsie turned out to be the best film I ever made. And to win my first Oscar for it was thrilling, not terrifying, the way it might be today. The awards were more casual then. You did your own hair; you did your own makeup. It wasn’t the fashion event of the season. After revisiting the ’80s and ’90s—during which she had two great loves: Mikhail Baryshnikov and the late Sam Shepard—Lange talks about her unexpected transition into not just television, but television horror. She says she never intended to do more than one season of American Horror Story, but that Ryan Murphy, “a great seducer,” convinced her to stay on for four years. Television, Lange later explains, is one of the many places older women in Hollywood turn when the “important” film roles stop coming in. And Lange isn’t just still working, she’s still winning. She received an Emmy for 2014's American Horror Story: Coven, and a Tony for her performance in 2016's A Long Day’s Journey Into Night. She’s even great in the otherwise forgettable 2016 comedy Wild Oats (which, by the way, is streaming on Netflix). You can read the full piece over at AARP. Did Jessica Lange Just Shade Matthew McConaughey?